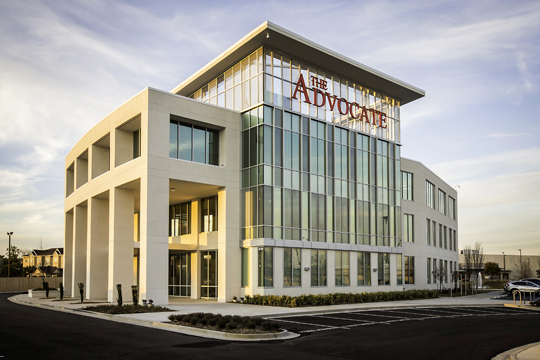 'The Advocate's new three-story, 48,500-square-foot corporate headquarters houses the newspaper's Baton Rouge newsroom as well as the business offices for all of 'The Advocate's daily newspapers. 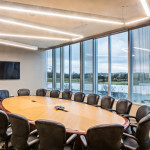 The publisher’s conference room is on the third floor of ‘The Advocate’s new corporate office building located on Reiger Road near Interstate 10. 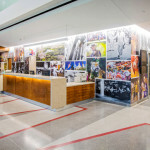 Wall murals with photographs revealing the history and culture of south Louisiana are in the lobby of ‘The Advocate’s new corporate office. 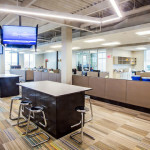 The project was designed by Remson|Haley|Herpin Architects and built by Lemoine Co. LLC. 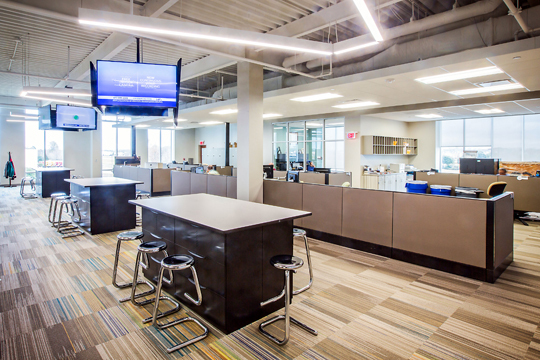 The newsroom in ‘The Advocate’s new three-story, 48,500-square-foot corporate headquarters features multiple widescreen TVs and collaboration space for designers and editors. 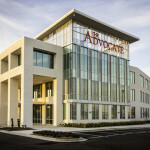 ‘The Advocate’s new three-story, 48,500-square-foot corporate headquarters houses the newspaper’s Baton Rouge newsroom as well as the business offices for all of ‘The Advocate’s daily newspapers. 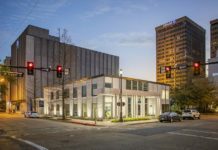 Use: Two and a half years after buying Baton Rouge’s venerable old newspaper, New Orleans businessman John Georges has moved The Advocate’s headquarters from an aging six-story building off Bluebonnet Boulevard, which it rented from the Rev. Jimmy Swaggart’s ministry. 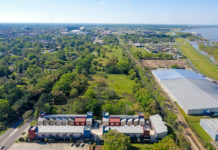 The newspaper’s swanky new headquarters just off Siegen Lane near Interstate 10 are located next to where its printing facilities were already housed. 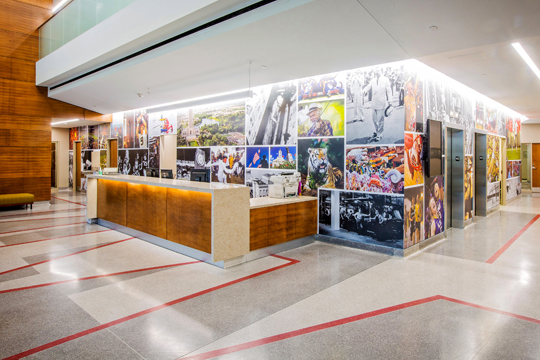 The new building features an expansive lobby with glass panel logos representing The Advocate’s various properties, including the New Orleans, Lafayette and area weekly editions. 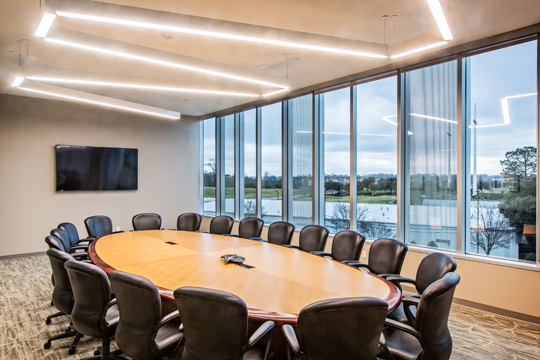 It also houses a spacious newsroom for its team of editors and writers, and the building’s exterior is covered with glass panels to allow for natural light. 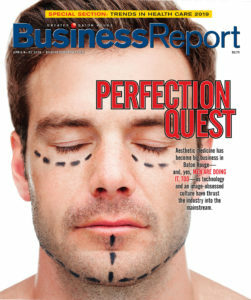 The location also offers high visibility off the interstate, with the newspaper’s logo emblazoned across the front of the building.